Ronda Rousey made her in-ring debut in WWE at WrestleMania 34 in 2018 but even before she stepped foot inside the ring, rumors doing the rounds suggested that she was working closely with Paul Heyman getting help with promos and other parts of her character. Becky Lynch called out Rousey and Heyman on Twitter and mocked their partnership. Ronda Rousey will defend the RAW Women's Championship against Becky Lynch and Charlotte Flair at Wrestlemania 35, which could be the first women's match to ever headline WrestleMania. 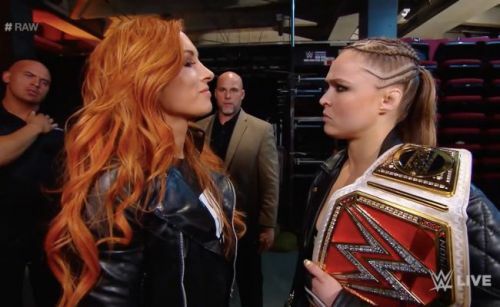 Rousey was originally supposed to face Becky Lynch in a singles match after 'The Man' won the 2019 Women's Royal Rumble. However, Mr. McMahon chose to suspend Becky Lynch instead and put Charlotte Flair in her place in the WrestleMania title match. Becky Lynch was then given a chance to win back her title opportunity after signing a Hold Harmless agreement. She beat Charlotte at WWE Fastlane with Rousey's help to make the match at Mania a triple threat. Becky Lynch came out on Twitter and hit back at Ronda Rousey's claim that she does not get told what to say by anyone backstage. Lynch mocked Rousey's close relationship to Paul Heyman and the face that despite Rousey's claims, Heyman actually helps her with her promo material. As previously mentioned, Ronda Rousey will be putting the RAW Women's Championship on the line at WrestleMania against Becky Lynch and Charlotte Flair.